A number of recent incidents have highlighted the dangers of paddling on an outgoing tide near a bar or river mouth. Paddlers must give consideration to tidal influences when paddling and consider alternative landing locations if they begin to be overcome by flowing water. 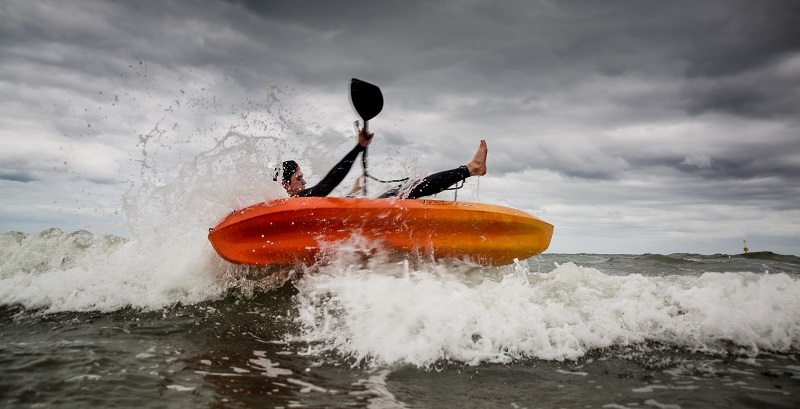 Being swept out to sea beside your kayak is hard to recover from. On all trips, paddlers should: Practise getting back on, and carry a means of raising the alarm - this may be a phone, marine radio or personal locator beacon. Gippsland Ports issued the following Notice to Mariners after an incident near the Entrance to the Gippsland Lakes on Sunday 29 April. The incident involved three persons operating kayaks in the entrance channel for a sightseeing excursion when environmental conditions were not suitable. Vessel operators are reminded that the ocean entrance to the Port of Gippsland Lakes can at times be very dangerous due to the run of the tide in the Entrance Channel especially the ebb tide. Bar crossings for all vessels is regarded as extremely dangerous and can cause serious personal injury or death when unfavourable environment and safety conditions exist. The run of the ebb tide which lifts and shortens sea conditions between the entrance piers and on the bar increasing the risk of swamping or capsize. The presence of other vessel operators (increased traffic conditions). Passage through the entrance channel and bar should only be attempted by prepared and experienced persons with sound local knowledge and only at times of fair weather, smooth sea conditions with little influence from the run of tide especially the ebb tide. Near real time tidal stream rates (current speed) can be viewed on the Gippsland Ports website. Operating vessels through the entrance channel and bar at times of heightened risk should be avoided at all times. Read more about paddling safety.